These Fish cakes are really tasty and light. You’ll find it hard to stop at one or two. Peel and cut the potatoes into even sized pieces, put into cold water and bring to the boil, adding some salt to taste. Boil for 20 minutes or until piercing a potato with a knife sinks in without resistance. Drain the potatoes and mash with the 1 oz of Dairy free spread or Butter. Leave it to cool. Once cooled, gently mix with the flaked cod, Onion salt, Garlic and Parsley. At this point, you can put it in the fridge for 1/2 hour to make it easier to mould into fish cakes if you like. But I use it straight away. Divide the mixture into six equal portions, or guess the size of a fish cake and dust your working surface with gluten free flour. It helps to put a bit in your hands as well. Gently form the mixture into a round, then flatten to about 7mm or however fat you'd like your fishcake. Do this for the rest of the mixture until all your fish cakes are formed. 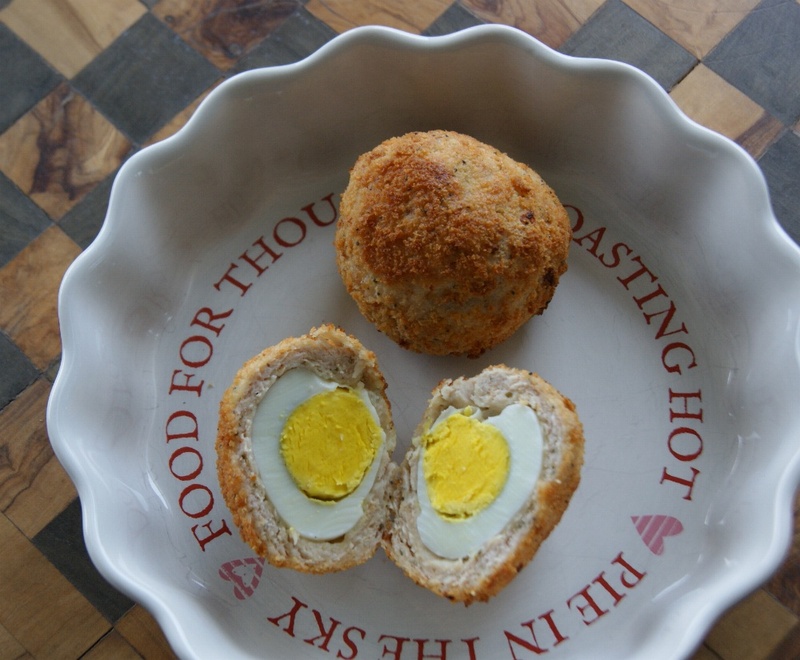 Next put your beaten egg in a shallow dish and some of the breadcrumbs spread out on a plate. 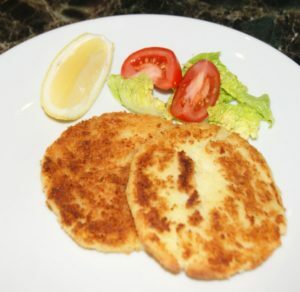 Carefully dip the fish cakes into the beaten egg, then place on to the breadcrumbs, gently push down, so the fish cake sticks to the crumbs. Then you'll need a fish slice or cake slice to lift up the fish cake and flip it over. Again push it down on the breadcrumbs, then move it on to a clean plate. Repeat this for all the other fish cakes. 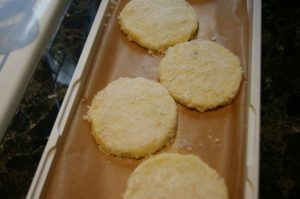 At this point, I lay all the spare fish cakes that I'm not going to cook on to some parchment paper (see photo) and put then in the freezer. They can be cooked another day from frozen. Heat some oil in a frying pan on a medium heat. 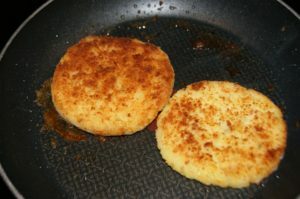 Cook the fishcakes until golden brown on both sides. I like mine with salad and mayonnaise - Mmm!